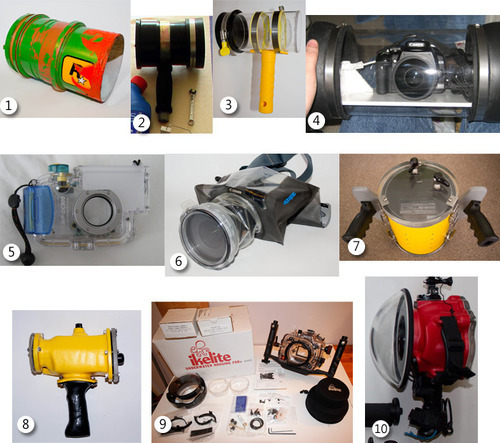 There’s already a post on the current gear I have for shooting photo’s (and video) in the water, what you didn’t see was the long list of housings I have had in the past. Both DIY home builds and off the shelf products feature in my history of housings, I’ve laid them all out below and will eventually put up a post on each interesting one as I get around to it. The original home made video camera housing. Featuring no controls, it was made from some large diameter drainage tube, the front is reinforced glass, it weighed about a tonne and the handle was a webbing strap. An updated version of the original tube design, this one had a flexible rubber cap so you could press the pause/record button on a camcorder, it’s made from PVC drain pipe and I used a Panasonic mini DV camera in it. Another DIY camcorder housing, this one is for a smaller Panasonic HD camcorder but it worked in the same way (this forms the basis of my new flash gun housing too, more in a future post). An interesting design for my first DSLR housing, I soldered up a cable release for my Canon 400D, I could only use it with the Peleng 8mm lens and the very edge of the picture showed the black caps, I got some surprisingly OK images from it but it was too bulky to use in the surf. Canon Ixus housing, this was a relatively inexpensive dive housing for my point and shoot Canon ixus camera, good fun but really awkward for shooting surf shots. Aquapac DSLR case, I wrote a full review of the Aquapac on RSKDIY, I’ll put it up on here soon too, it’s a good value option for relatively calm conditions, I wouldn’t risk it in proper waves. Second hand Dive housing, I bought it on Ebay and eventually sold it on Ebay too, after making some modifications which allowed me to use my Canon 550D inside it, I took some good photo’s with it and it offered a great value way to get some experience in the surf. HCW custom fibreglass housing for Panasonic camcorder, this was another Ebay buy and sell, 5-10 years ago it would have been awesome but now I’ve got a GoPro this kind of set-up is redundant, you could zoom with it but bulk and resolution of the camera meant it wasn’t really up to scratch. Ikelite Dive Housing, originally designed for an Olympus DSLR, I adapted it for my Canon 550D and took some pretty nice photo’s with it in Indo, when I got the chance to upgrade to a surf specific housing I grabbed it and sold this on, picking up a cheap Ikelite or similar dive style housing is an OK idea for starting out with surf photography but once you use a splash housing you’ll never look back. Aquatech CR-60 housing, with LP-3 dome port and pistol grip, this is the current one and quite possibly the last housing I will ever buy, I reckon cameras will be getting smaller and better and this thing will hold the 7D, so any future camera I buy should fit nicely in here, I might decide to add some controls to the back at some point but for now this is ideal. That brings it up to date, if you don’t want to spend a fortune you can definitely get in the water with a decent camera on a budget, don’t let the high prices of housings put you off, hunt out a bargain or save up, it’s been the most fun part of surf photography for me for sure. Pingback: Water Housing Controls - What Do I Need For Surf Photography?